I have had this T-shirt yarn in my collection for quite some time. I initially bought it to make a pouf but that never worked out. 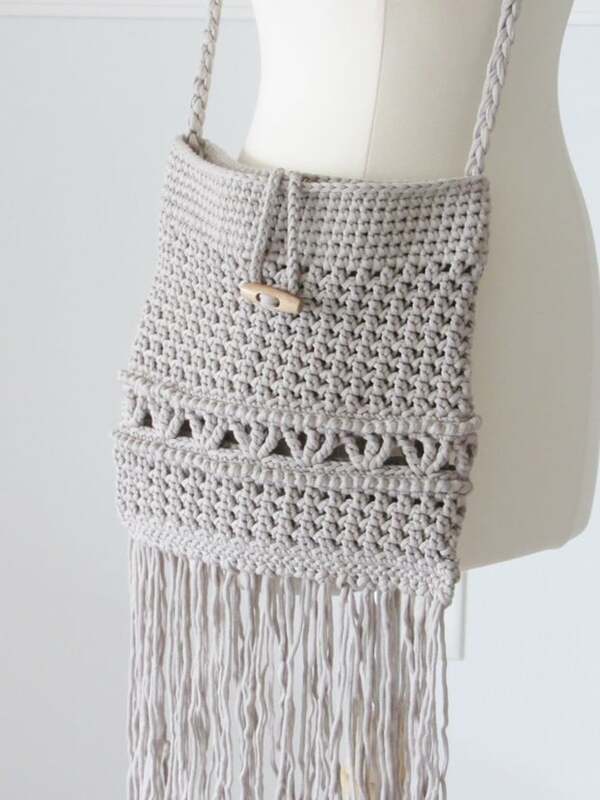 So I decided to design a crochet bag pattern with it. Once spring starts, I like designing smaller projects. That way, we can enjoy the sun and spend time with our kids while still finding some time to engage in our hobby. 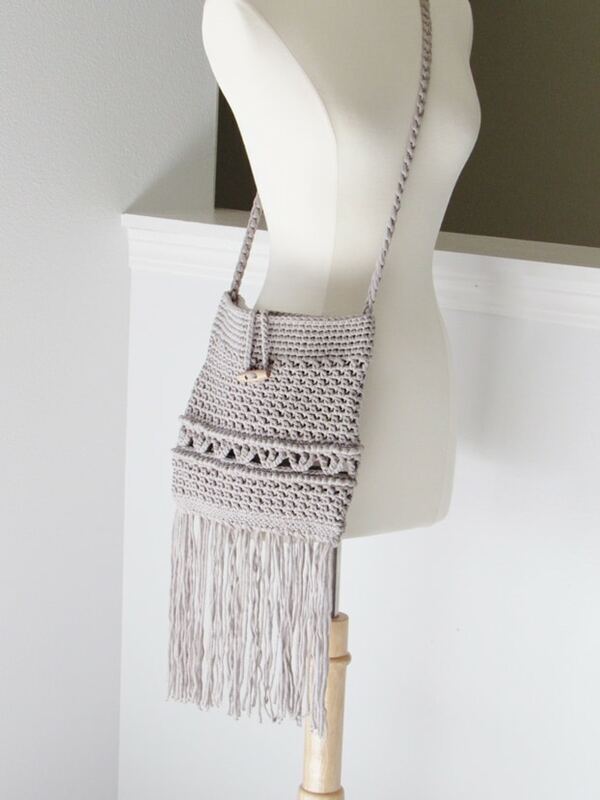 This crochet bag pattern took just one skein of the Benat Home Decor yarn and is a quick project perfect for anyone who does craft fairs. It would add variety to your inventory without taking too much of your time. 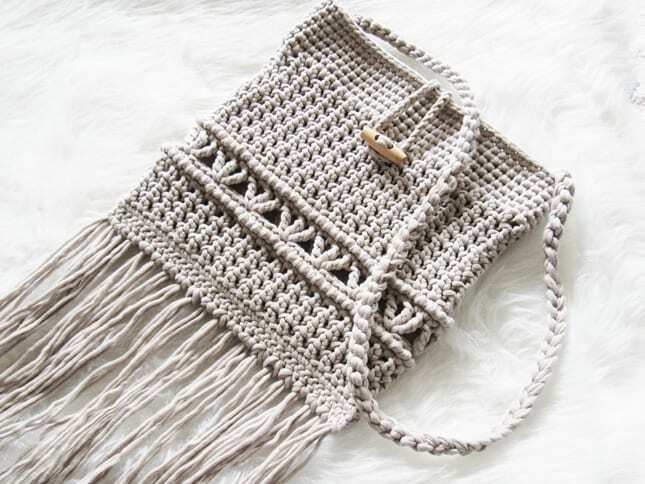 I was inspired by the Macrame bags and this yarn was just perfect for it. It has so much stitch definition, I bet there wouldn’t be a better yarn substitute for it. I have not added a lining to the bag yet as I did not have a matching fabric with me but I highly advise that you do. I have included instructions to add a lining. 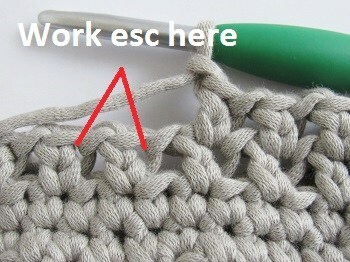 You don’t want your keys slipping through the gaps in the stitch pattern, do you? A lining will also make your bag more sturdy and keep it from stretching. You can work from the free pattern below or purchase and Ad-free PDF pattern for $2.50 here.The pattern will be emailed to you. 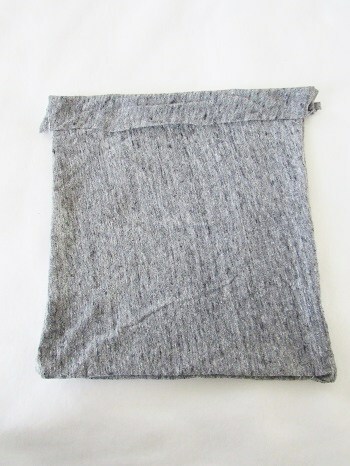 Bulky size 5 T-shirt yarn. I used Bernat Maker Home Dec yarn in color Clay. Tapestry needle with a big eye for weaving in. You can also use a smaller hook. Hook J (6 mm) for the bag and hook K(6.5mm) for the strap. Stitch markers for keeping track of your rounds. Matching lining fabric – less than 1/2 a yard. 10 inches wide and 10-1/2 inches tall not including the fringes. Rsc( Reverse single crochet): Worked like a regular sc but into the previous stitch. See video tutorial at the end of the pattern. sc2tog: It is a single crochet decrease that joins two sts into one. *(Insert your hook in the next st and pull up a loop), repeat from * one more time to get 3 loops on your hook, YO and pull through all the 3 loops on your hook. The bag is worked as a tube from the bottom up. The base is then seamed shut with single crochet stitches. 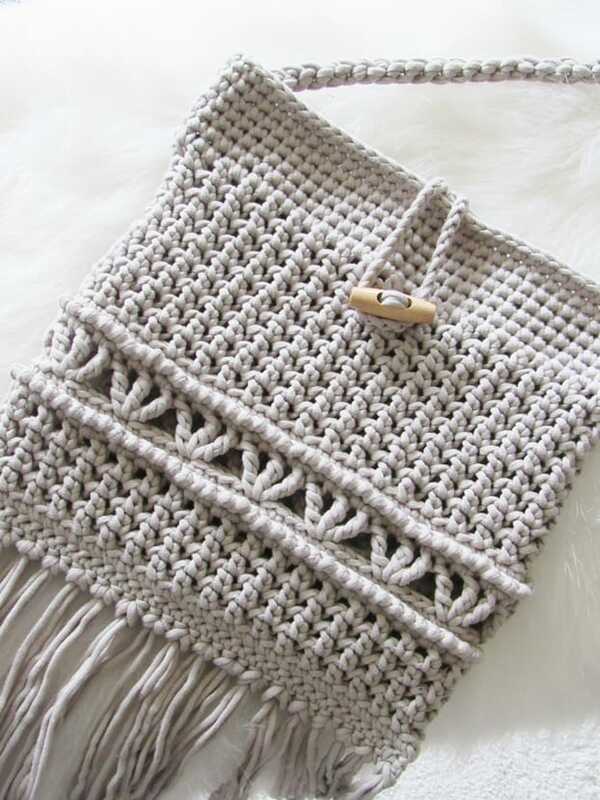 Fringe is then added to these single crochet stitches. You mostly work in rounds without slip stitching at the end of the rounds except when you change the stitch pattern. This ensures that your bag has no visible seam. Ch 74, sl st to the first ch without twisting. Your initial chain should be an even number. Round 8: Ch 2, 1 Rsc in the front loop only of the st to the right ( the previous st), 1 Rsc in each st across to end, sl st to beg ch 1. Do not turn. Note: For Round 10, the stitch count should be a multiple of 5 and that is why we added one extra sc to Round 9. Round 12: Repeat Round 8 to form another ridge. Repeat Rounds 3, 4 and 5 to add 3 more esc rows. Then repeat Round 5 six more times. Repeat Round 23 five more times. Last Round: 1 sc in the next marked st, move the marker up, 1 sc in each at across until you reach the middle back of the bag, ch 30 for button loop, sc in the next st, 1 sc in each of the remaining sts, sl st to the marked st. Fasten off. If you have a readymade handle that you saved from one of your old bags, you can attach that. If not, make the braided handle given below. The finished strap is 38 1/2 inch long before sewing but it will stretch. Cut 3 strands of 6-1/4 yards or 225 inches each. 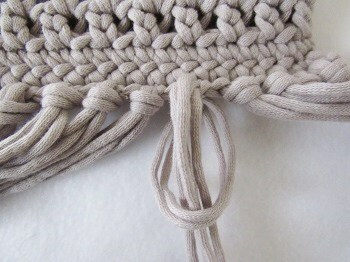 Using the bigger hook, leaving 6 inches of yarn, hold three strands together and start chaining. Stop when you have 6 inches of yarn left and fasten off. 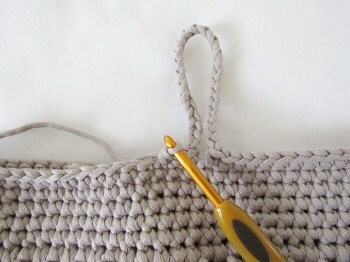 Using the yarn tails left, sew the handle onto the sides of the bag on the inside. Insert at least 2 inches of the strap inside and sew it down on both sides of the strap. Note: The lining once sewn should be a little smaller than the bag for it to fit inside, but make the top 2 inches a little wider as you will be sewing the top part to the bag and it shouldn’t end up too small. 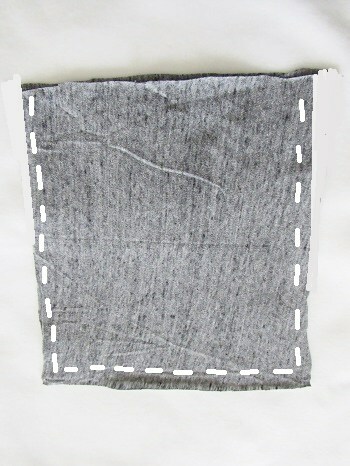 Fold the lining fabric, place the bag on top and trace around it making the top 2 inches a little wider than the bag. Cut the rectangles out. Overlap the rectangles and sew the sides and the base together with a 3/8″ seam allowance. Turn it inside out and fold down the top by 3/4 inches and keep it aside for later. 1. Join yarn at the base of your bag and seam the base shut with a row of sc, fasten off. 2. Wrap the yarn gently around a magazine 74 times. Cut along one end to get multiple strands of the same size. 3. Hold 2 strands together, fold them in the middle, use the hook to pull the middle through the corner stitch to form a loop, grab the tails with your fingers and pull through the loop, and tighten the knot to your liking. 4. 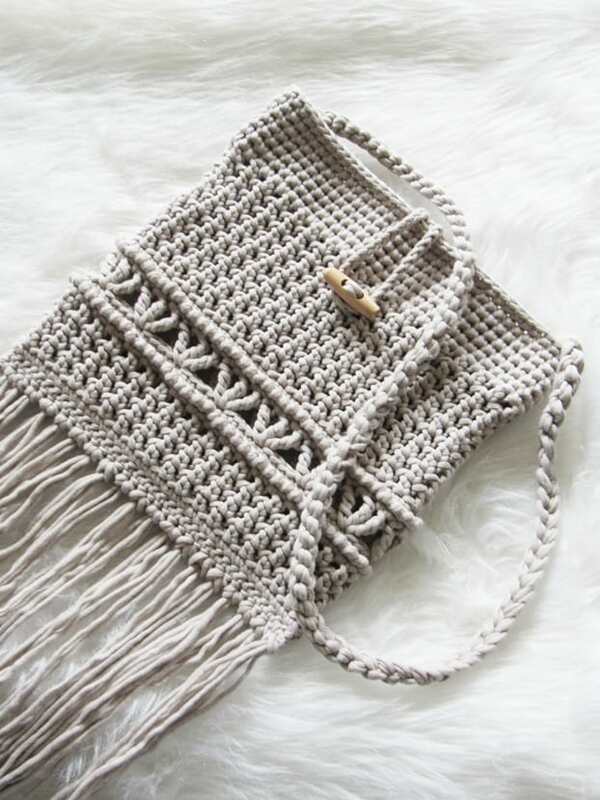 Add a fringe to every alternate stitch. If you want it to be thicker, you can cut more strands and add one in every st.
Insert the lining into the bag. 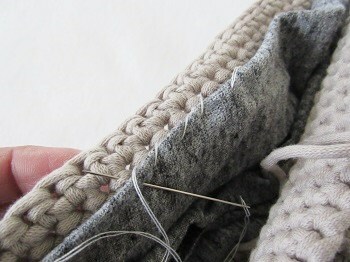 Sew the lining to the inside of the bag using a whip stitch. You might also like my Crochet Ruffle Bag Featured on Allfreecrochet.com and my Granny Square Crochet Bag.